Using the procedures that have been treatment-planned in the clinical chart or ledger, you can create a custom treatment plan for a patient. On the Tx Planner tab of a patient's clinical record, under Active, make sure Unassigned is selected. The procedures that have not been assigned to a treatment plan appear. 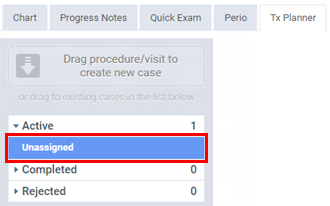 Create a new case and/or add procedures to a case as needed. To create a new case that contains a specific procedure, drag that procedure to the box on the left. To add a procedure to an existing case, drag that procedure to a case under Active on the left. Under Active, select a case to view the recommended treatment. The procedures you just added to the case appear. 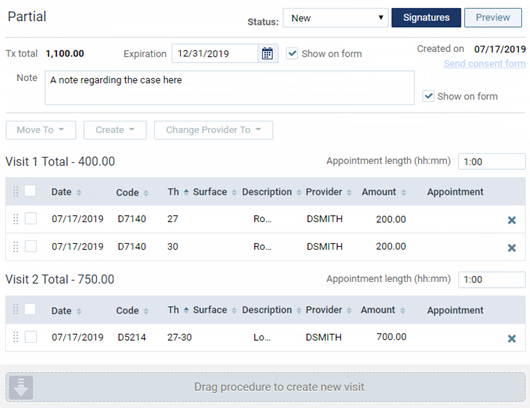 Create a visit, add procedures to a visit, and/or adjust the order of procedures in a visit as needed. To create a new visit, drag a procedure to the box below the visits. To add a procedure to an existing visit, drag that procedure to the desired visit. To adjust the order of procedures in a visit, drag a procedure to a location above or below another procedure in that visit. Specify the Expiration date of the case. You can choose a specific date or insert the last of the current year. To show the expiration date when presenting the case or on the printed copy of the case, select the Show on printout and preview check box. Enter a Note regarding the case. The note can be up to 250 characters long. To show the note when presenting the case and on the printed copy of the case, select the Show on printout and preview. To show the note when presenting the case and on the printed copy of the case, select the Show on printout and preview. By default, a new case has a "New" status initially, but you can select a different status as needed. New - If this is a newly created case that you have not presented to the patient yet. Presented - If you have presented the case to the patient. Accepted - If the patient accepts the entire case. Rejected - If the patient rejects any part of the case. The fees on treatment plans come from either the preferred fee schedule of the location where the procedures are treatment planned or, if there is not a fee schedule for the location, the treatment-planned provider's fee schedule. The fees do not take into account an insurance plan's fee schedule and coverage table or a patient's estimated portion. To change the duration of any visit, next to that visit number, click (or tap) the time length link, type a new duration in minutes, and then click (or tap) Save. 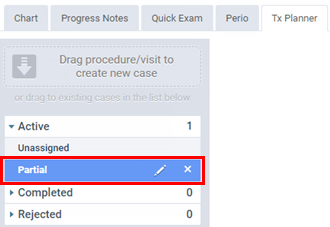 To add notes to a case at any time, under Active, select the desired case, and then type any notes regarding the selected case in the field near the top of the page. To rename a case at any time, under Active, select that case name, click (or tap) the Edit button next to the name to open the Rename case dialog box, type the New case name, and then click (or tap) Save.